The 463: Inside Tech : Regulation Without Tears? Recall the Janet Jackson wardrobe malfunction. Remember the FCC's actions. Then consider what it would be like if the FCC imposed roughly the same regulations and punitive actions on online video outlets that replayed the malfunction or showed homemade videos from people at the Superbowl? What if the FCC simply just proposed creating a more uniform regulatory structure that governed online video like traditional television broadcasts? How mental would the blogosphere get? Okay, this isn't happening in the U.S., but what if it were happening in Europe? Apparently not much. Because, as we mentioned as far back as December and again in March, it is. Under the Commission proposal, the modernised TV without Frontiers Directive would govern TV and TV-like services. To open up the present EU rules to technological developments, the proposal distinguishes between “linear” services (e.g. scheduled broadcasting via traditional TV, the internet, or mobile phones, which “pushes” content to viewers), and “non-linear” ones, such as on-demand films or news, which the viewer “pulls” from a network. Today’s TV broadcasting rules would apply to linear services in a modernised, more flexible form, whereas non-linear ones would be subject only to a basic set of minimum principles, e.g. to protect minors, prevent incitement to racial hatred and outlaw surreptitious advertising. When we wrote about this back in March, it was mostly American companies like Google, Cisco, Intel and Yahoo! who first raised objection to this language saying that the proposal could could have "unintended consequences" and hurt investment. (PFF, btw, warned of this last year). The European Commission and the UK are once again set on a collision course. Forget constitutions, euros or Maastricht. This time it's about something you care about: television, and particularly the future of TV and new media over the internet. The complex row between the UK government, the Confederation of British Industries (CBI), UK technology companies and the EC revolves around the cheerily named "TV Without Frontiers" directive. It's a proposed piece of European legislation intended to bring television in line with recent changes in technology. Viviane Reding, EU Commissioner for Information Society and Media, pledged not to intervene in business. "There will be no regulation of the Internet," Reding told ZDNet UK on Wednesday. "I'm not going to intervene in business — I am technology neutral," Reding added. Professor Michael Rotert, president of the European Internet Service Providers Association (EuroISPA), claimed that the Directive revisions were regulation of the Internet by stealth. "This is regulation of the Internet through the backdoor. We think Commissioner Reding has not understood the concept of the Internet. It might be she thinks she's regulating content, but you can't distinguish things so easily. Regulated self-regulation will be misused immediately, when it comes into practice,"
"shoehorn digital content providers into rules designed for traditional broadcasters, undermining high-value, high-tech economic growth when it should be stimulating it." According to the BSG, that could even include video blogs on websites. The EC disagrees, but even lawyers are confused. 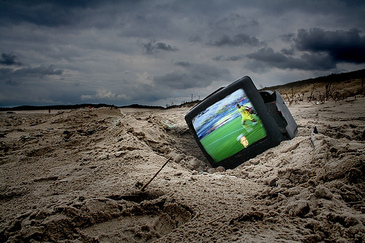 "The whole debate is about 'what is TV? '," says Cliff Fluet, a former television lawyer who works for internet law specialist Lewis-Silkin. "This is about keeping an industry alive. Defining what is TV is going to be the real headache." The communications and media regulator OfCom privately thinks the proposals are vague and unworkable. "The whole problem is with the definitions," said one OfCom official. "The EC say they want a light touch but because [the directive] is vague it will be a heavy touch. If you're a small company, to make sure you don't get accused of incitement to racial hatred you'll have to keep tapes of all of your content; that's a cost. How do we come down on a content producer if material that they produced went out at the wrong time, and to the wrong audience, because its broadcast was beyond their control?" The Guardian piece continues by diving deeper into why its going to be so hard to define TV in the near future. It's extremely enlightening and raises issues that have barely touched the device-starved US. But, needless to say, your iPod, phone, and TV are going to soon be interchangeable and regulators are going to be pulling their hair out here, too. We talked about this a bit last May when we introduced the pPod (or policy Pod). "The proposal aims to cover audiovisual media services, and I stress media," she told a hearing in the European Parliament. "It will cover services under the editorial responsibility of media services providers, the principal purpose of which is the provision of programmes with moving images, with or without sound, to inform, entertain or educate," Reding said. Video bloggers don't inform, entertain or educate? Thanks for posting this and for all the information you provided. This topic gets very little focus on this side of the pond, but there are plenty of examples of folks in the US who view Europe as an incubator for regulations they'd like to impose over here. We have to remain vigilant. Janet Jackson? I'm not her fun..
British Bankers' Association here. It should be noted that the seepch was from an EU perspective. The UK's banks follow the highest standards of customer protection in their data management. If a customer's personal data may have been breached, banks already undertake to inform the Information Commissioner's Office, the Financial Services Authority and the customer, where appropriate. We understand that Commissioner Reding proposes to make similar practices mandatory across the EU. It is unlikely that such a step would affect the current practices of the UK's banks, except to make mandatory these existing voluntary practices.